Sewing is easily my favorite artform passed down from one generation to the next. I loved watching my mother create clothes, costumes and Christmas stockings for us (and our dolls), and couldn’t wait to have my own turn at her sewing machine. The machine itself was a wonder. Even my little brother would sit spellbound in my mother’s lap as she wound a bobbin and threaded the machine. Long before I could sit solo at the machine, I was learning the language with hands-on lessons of phrases like “with the grain” and “on the bias.” Even the names of the fabrics seemed magical: gingham, seersucker, dotted Swiss, and broadcloth. I also learned that a whole lot of time and preparation went in to the process and the importance of measuring, pinning, basting, and pressing as you go. Skipping steps and cutting corners, while tempting, could mean a disaster of a finished product. Patience was key because doing it right the first time would save you the heartache of having to rip out your stitches to do it all over again. My mother’s machine did several decorative stitches, my grandmother’s only did a straight stitch, and my great-grandmother’s was a foot-powered treadle. But in each generation, the sewing machine made possible both the pretty and the practical. My great-grandparents raised six daughters in the Depression era. Just as important as making garments from scratch was mending those in disrepair. A perfectly patched plaid work shirt is also the mark of a true sewing wizard. Nothing went to waste, and when a shirt just couldn’t be patched any more, the fabric it was made of was relegated to the status of a cleaning rag only after the buttons were removed and placed in the beloved button jar. Now that I have one of my own, I understand how my mother could look through hers and her mother’s and recite the specifics of each button, not just whose dress it was sewn on, but the occasion for which the dress was made. As the child and grandchild of true country folks, there are many symbols of their resourcefulness that I cherish, and one especially dear is the calendar towel. 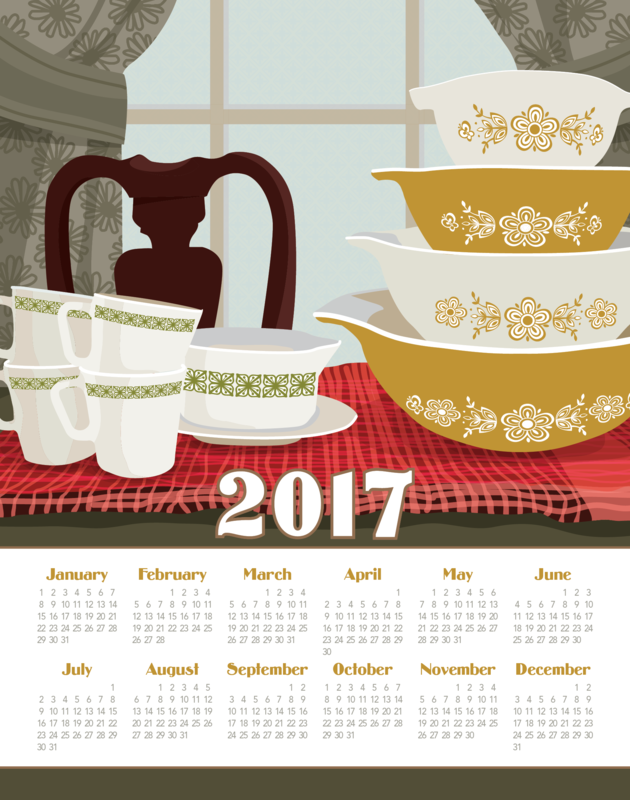 A gift from the local cotton gin, our current calendar was always prominently displayed in our home. At the end of the year, the towel was repurposed to dry dishes and little hands, and became a soft, faded reminder of the passing of time. Each new edition was hung in its place of honor and the tradition married past and present in a useful, familiar way. 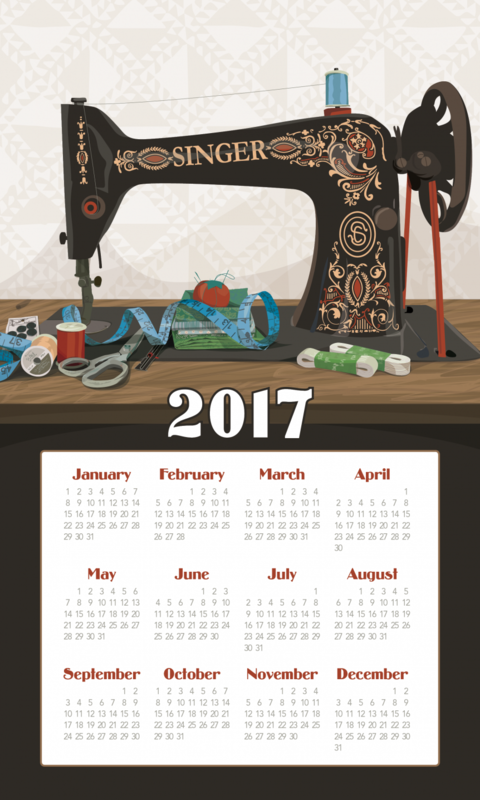 In its fifth year, the Richard Creative Calendar Towel celebrates the Singer sewing machine as the ultimate symbol of creativity and thrift. Even if replacing a button by hand is the only sewing that you do, perhaps the magic of this iconic image will lend inspiration to your home. 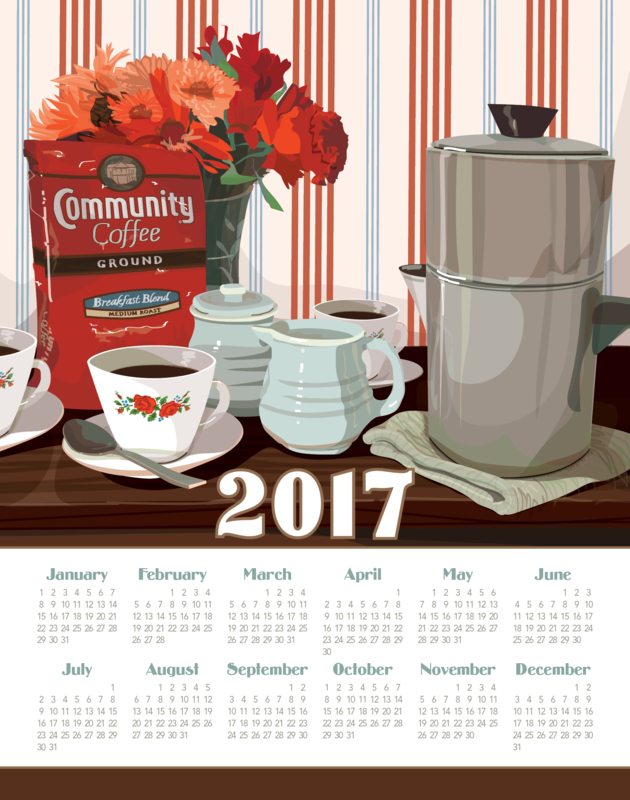 I hope that you display your calendar towel in a place where you find joy and comfort in the memories of those who took the time and used their skill to sew for you. Click here to purchase your own. 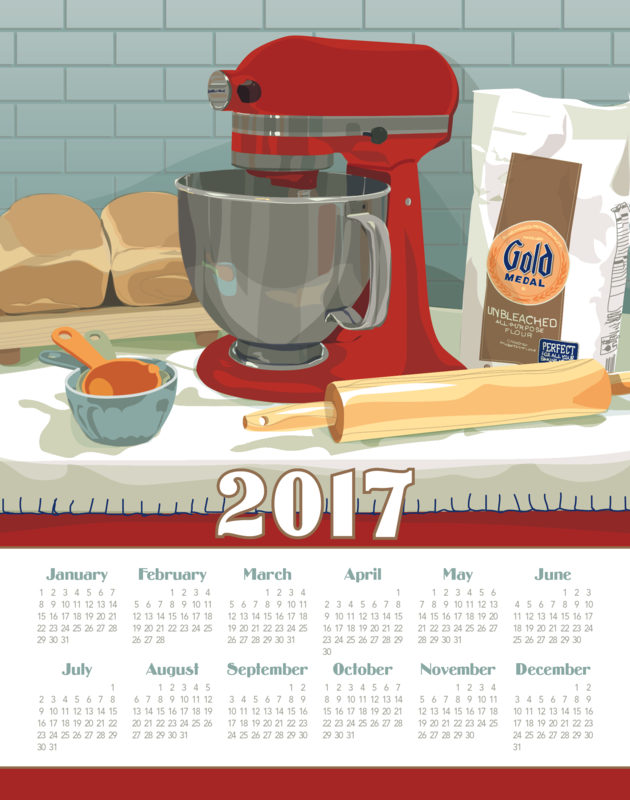 We also offer a limited number of illustrations from previous years paired with the 2017 calendar. 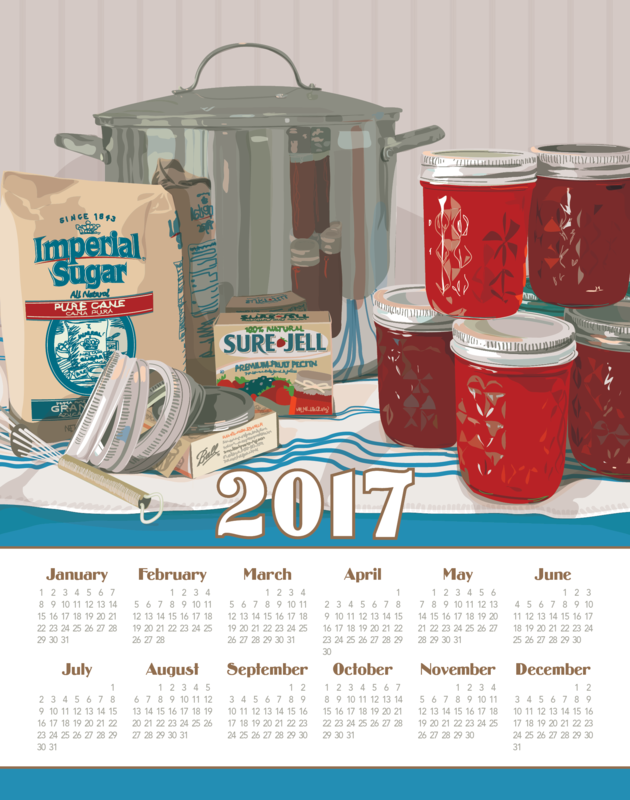 Browse for your favorite or gift one to a friend.